AFTER the Gloucestershire Warwickshire Railway opened its eagerly-awaited northern extension into the tourist honeypot of Broadway on Good Friday, passenger numbers have doubled at a stroke. Commercial director Colin Fewell revealed that nearly 6300 fare-paying passengers travelled on the extended 15-mile line over the Easter weekend and also the following week – compared with just over 3100 during Easter 2017. The line opened its brand-new Broadway station on March 30 with the 9.40am departure for Cheltenham being the first public train from the village since March 6, 1960, when the station was closed by BR. 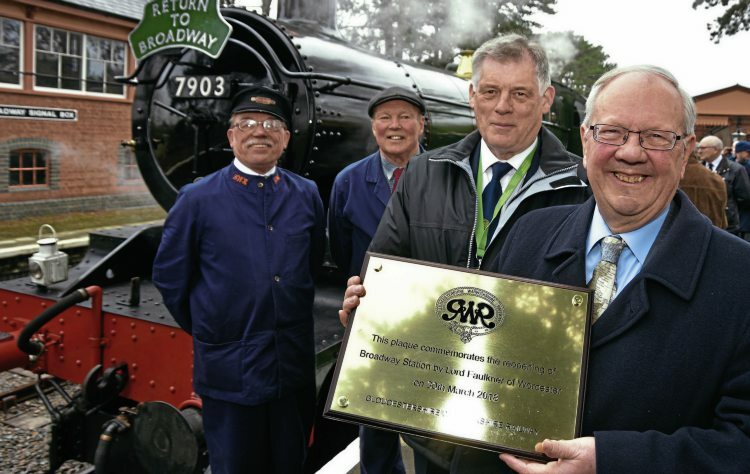 To mark the occasion, Lord Richard Faulkner of Worcester, chairman of the Heritage Railway Association and a patron of the line, unveiled a plaque to commemorate the occasion before accompanying driver John Cruxon and fireman Chris Smith on the footplate of WR 4-6-0 No. 7903 Foremarke Hall for that first departure.